WCB Boerdery is a table grape farm situated next to the small town of Saron in the Cape Winelands region was established in 2012 by Warren Bam as the sole beneficiary. The approximately 22 hectare farm had 13 hectares of table grapes newly cultivated at the beginning of 2013. Approximately 9 hectares of organic table grapes in production are leased from the farm owner. Bam is an experienced farmer and has been in this business for more than 10 years. He initially grew organic grapes and blueberries for Nature & More in Saron. As a little boy, he always dreamt of becoming a farmer one day. After completing his commerce studies, he started his farming career at Lushof farm as the farm manager. He loves working with the soil and wants to see everyone enjoying healthy and tasty fruit. 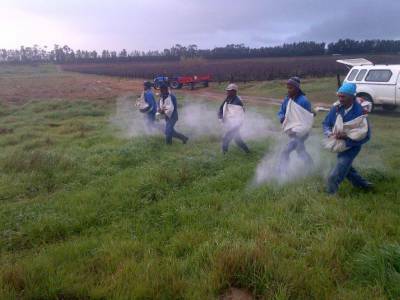 The Western Cape Department of Agriculture (WCDoA) financially empowered WCB Boerdery through its Comprehensive Agricultural Support Programme. Approximately R4 million was approved during a 2013/14 Table Grape Commodity Project Allocation Committee meeting. These funds were managed by Casidra for the procurement of production inputs for their 22 hectares, 8 ton truck, forklift, weighing scales and harvesting crates.